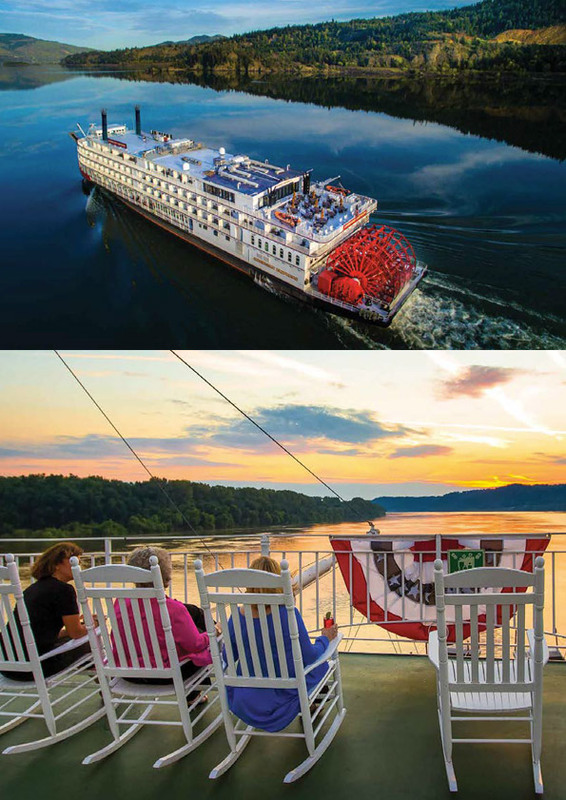 Experience America’s history, geography, music, culture and cuisine on these uniquely traditional American River Cruises aboard three iconic paddlewheel riverboats. Discover the most all-inclusive river cruise experience in North America with the American Queen Steamboat Company, enjoying gracious hospitality and service from a friendly all-American crew. Your journey will be more than a river cruise to iconic cities and quaint small towns; it will be a voyage of mind, body and soul. Each day and evening lends the opportunity to delve into the dramatic history and musical influences of a region, exposing you to an onboard experience that penetrates the realm of extraordinary and transcends into something beyond measure. The American Queen Steamboat Company's vessels are testimonies to the floating palaces of long ago and a culmination of their finest qualities. Grand in every sense of the word, you will discover a blend of every bold paddlewheeler innovation along with pristine, authentic design. Each vessel boasts an inclusive range of amenities and hospitable services to deliver a uniquely American experience for a truly rich river cruising holiday. Shore excursions, both included and premium, are thoughtfully designed to optimise the guest experience by providing plenty of activity and endless enjoyment. A dedicated fleet of deluxe motorcoaches and talented shore excursions staff await you at the vessel’s dock in each port of call offering hassle-free access to some of the most historically and culturally significant attractions in America. Regardless of which vessel you choose for your river cruise holiday, each voyage includes signature Hop-On Hop-Off guided shore excursions – your ticket to experience the freedom of choosing your own path and get acquainted with the historically rich ports that you will encounter, with selected admissions and narrated tours. Award-winning Premium Shore Excursions offer you an opportunity to delve deeper into your specific interests and provide comprehensive, in-depth and rare experiences at an amazing value. Complimentary bicycles and helmets are also available at each port on your river cruise. With so many picturesque towns along the rivers, cycle at your own pace on an independent exploration of the riverfront, shops and sites. Staff will provide you with local attraction maps and guides to help with your planning and navigation of each port. Many itineraries are uniquely themed and feature special entertainment to create a river cruise unlike any other. Join a music-themed cruise such as a 50s and 60s trip down memory lane or take a festival cruise for Thanksgiving, the Christmas Markets or New Year’s Celebrations. Whether you are engaged in a themed voyage special event, a captivating tale told by the Riverlorian or an energised musical performance led by our top entertainers, each vessel hosts a wealth of impressive entertainment that is sure to satisfy. The largest steamboat ever built, the grand American Queen is a gracious and elegant triumph of American ingenuity. Relax in a warm, inviting atmosphere of charm without sacrificing modern amenities. The rooms display all the opulence of the American Victorian era. Glistening woodwork, fresh flowers and antiques adorn her interior spaces. Outside, lacy filigree evokes memories of the many stately riverboats that preceded her and so inspired her designers. The largest overnight riverboat west of the Mississippi River, the American Empress follows the trail of Lewis & Clark on the Columbia & Snake Rivers and delivers classic elegance and modern luxury on a grand scale. One step onboard and you will quickly discover that there is far more to this vessel than her welcoming appearance and signature red paddlewheel. The American Duchess is a floating, intimate masterpiece that can carry up to 166 guests through America's heartland, cruising the Mississippi, Illinois, Ohio, Tennessee and Cumberland Rivers. The paddlewheeler, created from a 1995 hull, was completely reconstructed to become one of the most luxurious river cruising vessels in the country, featuring single-seating main dining and entertainment venues, soaring ceilings, and all of the features guests have come to expect on other American Queen Steamboat Company cruises. Explore the world of Mark Twain on the legendary Mississippi River. Journey through the Antebellum South. Itineraries include the historic cities of New Orleans and Memphis. Experience early American history and picturesque river towns, as well as some of our most popular theme cruises. Follow in the footsteps of Lewis & Clark through the pristine beauty and intriguing history of the Pacific Northwest. People who ordered American River Cruises 2019 also ordered the free travel brochures below. Click on the images to find out more about these brochures.